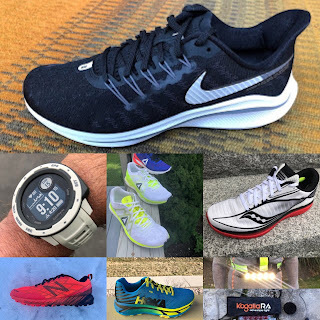 Road Trail Run: Nike Zoom Fly First Run Impressions Review: Good Form Required! Light, Well Cushioned, Great Upper and Stiff. 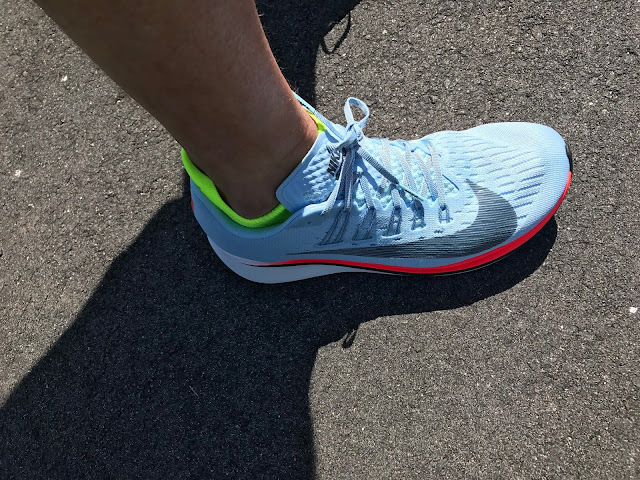 Nike Zoom Fly First Run Impressions Review: Good Form Required! Light, Well Cushioned, Great Upper and Stiff. Editor's Note: The eagerly awaited Zoom Fly was released June 8. I received a pair and immediately took them for a run on a high 70's, high pollen day so not my best running weather. Much more to come as we run more miles with a 3 runner full review but here are some details and first impressions. Weight: 8.35 oz/237 g for our sample size 9. 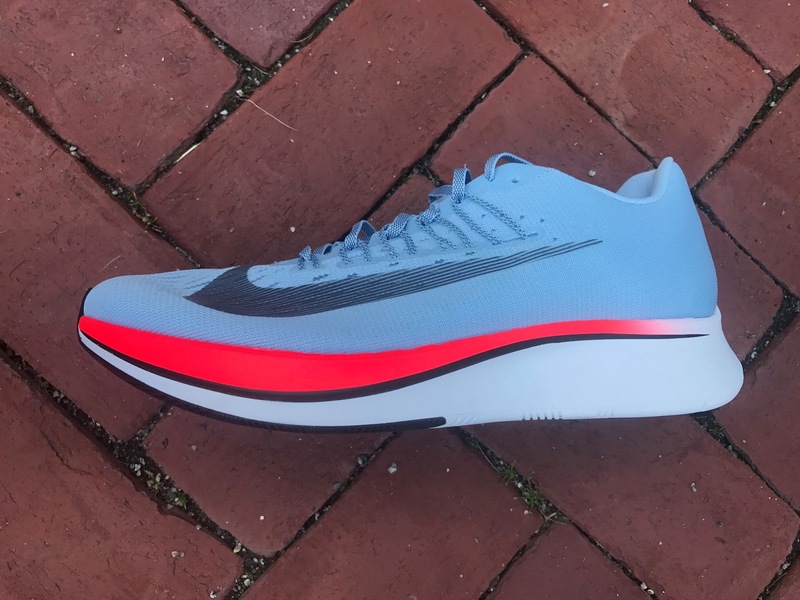 The Zoom Fly is a light very cushioned performance trainer racer with an embedded curving plate for propulsion and stability. The plate is roughly in the location of the black line on the midsole, dipping down steeply at the ball of the foot then curving up towards the toe. The shoe is completely stiff. I was not able to hand bend it at all. The Zoom Fly represents a very bold departure from the conventional low slung and often harsh racing shoe performance trainer By and large we think Nike has combined outstanding cushion, especially in at the often overly thin forefoot of such shoes ,with a highly responsive ride and all of this at a light weight. Bottom line these are very similar shoes in terms of overall design but... with lighter and higher performance materials in the 4%. I only jogged around for a minute or two in the 4%, and this in a hotel lobby, and have now run 5 miles in the Zoom Fly. The Vaporfly 4% was a distinctly lighter shoe with a smoother feeling also silky and yet more dynamic cushion and most interestingly more of a sense of very dynamic forward tilt/drop forward to toe off than the Zoom Fly. I wonder if the plate geometries are different as the black line indicating the carbon plate looks like it dips lower in the Vaporfly or maybe as the VaporFly has 2mm less stack that the plate sits closer to the outsole or am I feeling the combination of carbon plate and Pebax vs carbon injected plate and more standard Lunarlon? Both the Zoom Fly and Vaporfly 4% were in the same size 9 , a half size up from my normal 8.5. Vaporfly 4% was clearly less supportive for me and I am sure I would go true to size in it maybe even a half size down, while in the Zoom Fly my half size up pair with cushion socks fits correctly. Those who wear very thin socks and like a snugger fit could go true to size in the Zoom Fly. There is no toe bumper upfront beyond a small rubber wrap up at the tip. My foot was well and very comfortably held. Credit I think going to the excellent implementation of the Flywire cords through the laces and the soft, relatively thin and foot conforming engineered up upper. Not an easy task to have a well held stable foot on such a high stack shoe. The upper looks highly breathable. The tongue is un padded, a mesh with some knit height structure and overlays. Lace up was comfortable with the laces flat and thin. The heel counter and heel collar is very high and substantial, likely to keep mere mortal heel strikers stable over the narrow rear of shoe midsole/outsole. It seems to work effectively for me. The midsole is Nike's Lunarlon foam with of course that embedded full length carbon infused nylon plate. The cushioning is outstanding, particularly in the forefoot where they truly feel have "maximalist" cushioning comfort feeling like they sit somewhere between a Hoka Clayton and Hoka Clifton but with less mush and more stability than the Clifton from the full coverage outsole rubber up front and a touch softer than the Clayton. We really like full coverage forefoot rubber and the Zoom Fly's is for sure full and looks durable. It's not a particularly narrow heel over all, certainly wider than the Zoom Streak 6, but it tapers at the far rear. While the cushioning is fantastic at the heel, as a heel striker I wish for some more width back there, a more rounded less pointy far back of the outsole for landing stability. Elites and mid foot strikers will have less of an issue but for me the stack is high and the landing ends up narrow and a touch unstable. I think Zoom Fly is a shoe designed for "strong" fast runners with good form. At speed if you are heel striker with poor knee lift, like me, you will wish for some more heel width and then struggle somewhat to get to final toe off to get past the very front of the shoe plate stiffness. Interestingly the Nike All Out Flyknit was one of my favorite shoes of 2016. It to was very stiff but.. had a single hard to flex but very snappy flex point. The cushioning, stability and fee, particularly upfront is outstanding, At 23mm stack in the forefoot in a shoe designed for speed it has to be. Unlike a similar geometry light shoe such as the Hoka Clayton (24mm upfront) I think the Zoom Fly requires better overall form and some knee drive forward to go fast, whereas the not as stiff Clayton requires less but is not as responsive, cushioned, or polished in overall upper execution and comfort. The heel cushioning is also superb but the pointed far rear geometry favors those who do not land far back on the heels. 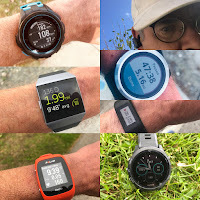 As my pace picked up the heel improved in feel: firm yet cushioned at the same time with very low shock/vibration transmitted The forefoot really didn't change in feel run slow or fast and remained stable and cushioned. Overall the Zoom Fly reminded me of the Streak 6 without all the harsh shock so Zoom Fly is, yes for sure, a stiff shoe with firm cushioning that at the same time dampens shock. The dip in the plate clearly feels great at mid foot and is effective but I missed some flex at the very front of the shoe to get off the ground at faster paces. Even in my short 5 mile run at moderate tempo 8:40 pace I had a touch of numbness in one foot. My second run was a 6.7 mile progression averaging 8:15 miles with the last 2 miles just under 8 minute miles. They are stiff and one needs to adapt to them that's for sure but they felt slightly less stiff and awkward the second run so they are potentially breaking in so give them more than one run to be sure they work for you. They felt very good for me in pretty narrow window of pace: between 7:55 and 8:30 or so a rolling along feel, somewhat faster than marathon pace and slower than half pace of 7:28-7:42. Slower and I was to much back on the heels and they felt sort of unstable, faster than 8 minute pace or so I was working hard to drive up and forward and struggling to increase cadence to get moving faster yet. I was rolling along just fine and happy in that narrow window of pace. The next day I had less of the leg soreness I would expect from such an effort so the cushioning while firm is clearly effective and thus I could well see how over a marathon distance legs might stay fresher. This said I did have slight achilles and calf soreness so I was working my legs differently than usual. 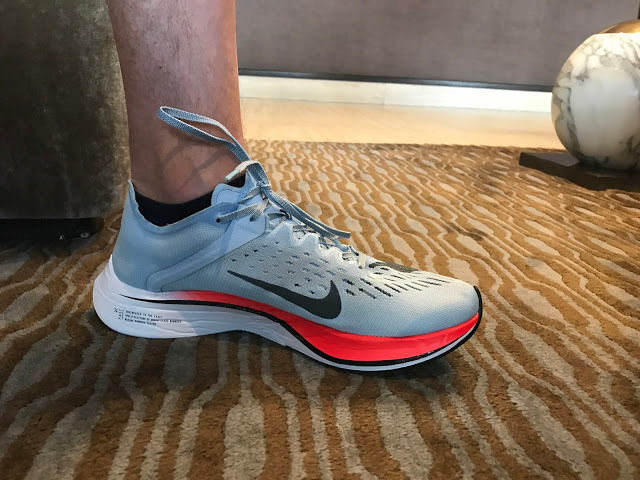 There is no question that faster runners (sub 1:37 half marathon my guess at this point) seeking a highly cushioned, light Nike should consider the Zoom Fly as a daily tempo trainer and long race shoe if your form is good and you are strong. I did not actually run beyond a few dozen yards in the higher end Vaporfly 4%. The sense of "falling forward" seemed more distinct than in the Zoom Fly. I wonder is the plate geometry is more extreme in some way or the carbon more reactive. If this is so, I think it might in fact be a better choice for me if the upper is supportive enough particularly in the heel. Recall while the Zoom Fly has a full high and substantial heel counter, the Vaporfly 4% has none relying on overlays for support. Road Trail Run will be testing the Vaporfly 4% when it is expected to release in mid July. The Zoom Fly was provided at no charge. The opinions herein are entirely the author's. Sam is a 1:38 half marathoner on a good day and doesn't mind at all going into a new decade age group in 2017. He runs approximately 40 miles per week. He is the Editor and Founder of Road Trail Run and has been running for 45 years and has a very dated marathon PR of 2:28. Sam is also the Senior Contributing Editor for Wearable Fitness Technology at Competitor Magazine. Click Here for Latest Running Shoe and Gear Reviews, over 65 in 2016, 30 in 2017 so far! Purchases here help support RoadTrailRun and are Much Appreciated! The Zoom Fly is available now from the stores below! How does this fit into a Pegasus / Elite / Streak scenario? The Pegasus 33 was my daily since last year and got the Streak for faster / shorter runs. I have the Zoom Fly on the way and would love your thoughts. Thanks. Hi Howard, Thanks for reading and writing. We will have a full review in a week's time with 4 participants including 2 who I know have run all of the shoes you list above. Except for me they are all sub 3 hour marathon age group runners. I have run all expect the Elite. I find both the Pegasus and Streak 6 to be harsh and firm which the Zoom Fly certainly is not. My sense is that the Zoom Fly is a marathon shoe for many who are fast enough for it but may not be a half of 10K shoe. It's sweet spot for me seemed to be between my half and marathon pace. Please chime in with your impressions after you have run them. Thanks for the feedback. I max out a Half Marathons, so I'll have to see if this is right for me. I thought would detail my findings with the Zoom Fly. I note in your review you talk of a touch numbness in your foot. I have to second this. I wore a pair of Zoom Fly yesterday in a road 10 km. After 6/7 km I felt at the ball of my right foot a sensation similar to when an ill fitting sock ' balls ' under your foot. In the course of the race I could not be sure whether it was my sock balling or something else. The sensation did not stop me running but was definitely an irritant every foot fall. Incidentally the left foot was unaffected. Anyway I continued onto the finish and after 10 mins post race the sensation wore off. Later still, on removing the shoe, the sock was intact and did not display any balling. Was it a one off ? I will put this theory to the test 3 days from now when I do a 30 min tempo run whilst wearing the shoe. I do not have an odd gait or foot plant. I am a run of the mill Pegasus wearer and weigh 9.5 stone. Up until recently I used to do fast sessions in Air Streak 5 & 6 but a right leg calf strain now makes me wary of this shoe. Annoying as I wanted that ' special ' shoe for fast runs & races. If the issue persists then I will take it up with Nike. I might have to try the Adidas Adizero Boost as my faster shoe. Thanks for commenting about your experience. I feel that the cushioning may be to firm for the geometry of the plate embedded and especially where it plunges down at the ball of the foot and then is right above the outsole. To firm? No such issues with the Vaporfly due to its softer Zoom X combined with stiffer carbon plate. I did find and it may apply to Zoom Fly that if your foot volume is not taken up in the shoe as it was in the VaporFly at my true to size and if I recall Zoom Fly too that a thicker sock stabilized things. I once raced the VaporFly in a very thin sock at my true to size and got some pain there. Since thicker socks and zero issues.